People who develop sensitivities to pine allergens can have allergic reactions from touching, inhaling or consuming these allergens. Pine species with light pollen grains may cause hay fever symptoms, whereas heavy sap is more apt to produce allergic manifestations upon contact with skin. People with pine allergies may react to any member of the genus Pinus -- evergreen conifers that include white bark pine, ponderosa pine and balsam fir, a popular Christmas tree. Pine nuts come from commercially grown pine trees, and rare but very serious allergic reactions to pine nuts have been reported. 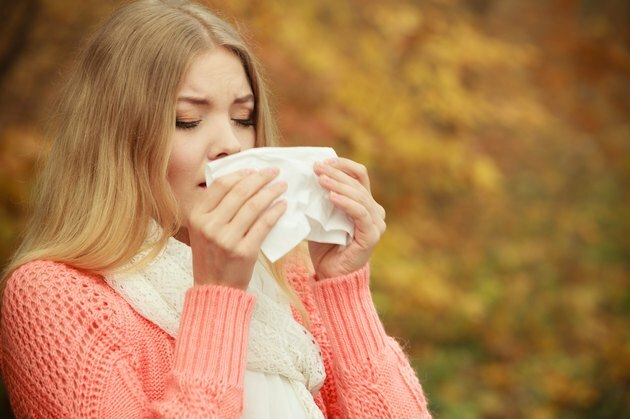 Symptoms of hay fever, or allergic rhinitis, arise seasonally from inhaling airborne pollen grains or inhabiting an enclosed space with pine tree allergens. Tree pollination occurs in the spring in most North American climates. Allergic reactions from handling pine needles, sap or products that contain pine may result in contact dermatitis at any time of the year, however. Touching pine trees or their products can result in a red, itchy rash in sensitive individuals. Hives or blisters may form and linger until after contact with the allergens has ceased. Recent studies on "Christmas tree allergy" are lacking, however an older Christmas tree study of 1,657 allergic patients is still informative. Overall, respiratory and skin allergies to conifers occurred in 7 percent of allergic individuals: the seasonal syndrome was described as including sneezing, wheezing and skin rashes that come and go. Most people developed symptoms within 24 hours, but for 15 percent, symptoms took several days to develop. Investigators looked into the possibility of mold allergies from trees, and while molds were present on the bark of trees, they were not found to be airborne. Pollen from weeds, grass and trees was, however, observed to be released into air while Christmas trees were in the house. While there were no definite answers, the authors felt that oleoresins, or balsams, were the most likely culprit for symptoms designated as Christmas tree allergies. Pine dust from sawing pine tree logs can impact allergies and may be associated with worsening asthma. In a study of this phenomenon, both green sawdust and dry pine dust were associated with changes in lung function. Exposure to green dust, in particular, seemed to have a sensitizing affect, impacting an individuals risk for developing future allergies. Pine nuts come from pine trees: Pinus pinea is the largest producer of commercial pine nuts, although seeds from other species, such as Pinus koraiensis and Pinus gerardiana, are also eaten throughout the world. When it comes to pine nut allergy, even small amounts can induce dangerous allergic reactions in sensitized individuals. Life threatening anaphylactic reactions have been reported after consumption of pine nuts as part of pesto sauce salads, meatballs and meat, and in cakes, candies or cookies. Work with your doctor to determine the cause of your allergies and the best strategy for management. In addition to allergen avoidance, your doctor may prescribe an EpiPen to have on-hand for emergency use, preceding a trip to the ER, if you have life-threatening allergies. For the less severe and more common allergic reactions to pine, your doctor may recommend topical steroids for rashes and/or intranasal corticosteroids, starting in advance of the pine pollen season; prescription/over-the-counter antihistamines/decongestants to help alleviate the symptoms of allergic rhinitis may also be recommended. Reviewed by: Tom Iarocci, M.D. U.S. Department of Agriculture: Pinus L.
What Are Top 10 Worst States for Allergies?